Banana Chocolate Oatmeal Buckwheat Buttermilk Muffins!!! Sorry – I just don’t know what other name to give this recipe! Any ideas? 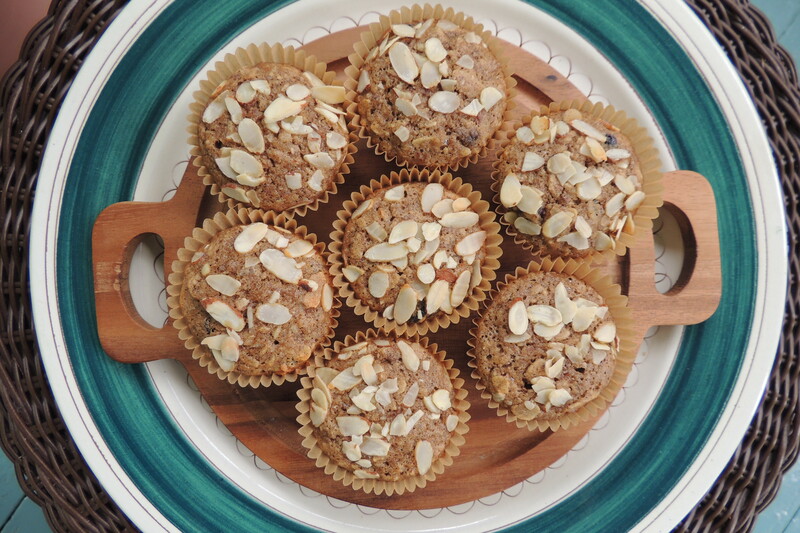 Almost guilt-free, these muffins are packed with nutrition. They keep nicely for a few days out of the refrigerator and taste even better the next day after baking. Be sure to use extra-ripe bananas for more sweetness, and if you’re not into chocolate, substitute dried cranberries or simply leave it out. Makes 12 muffins. p.s. This recipe was updated in December 2014 after a lot of experimenting in the past few months. If you tried the previous version, be sure to try this one. It now makes a full dozen muffins, has a better texture, more fiber, and more flavor!! Preheat oven to 400 degrees and place liners (I like the unbleached kind) in a standard 2″ muffin pan. In a large mixer, combine first five ingredients, beating well. Add all other ingredients in order given, mixing until just combined. Do not over-mix. Fill each lined muffin cup with 1/4 cup of batter and sprinkle tops with sliced almonds, if desired. Bake for 20 minutes until nicely crowned and slightly browned. Too healthy for you? Try serving with Orange Butter: Beat 1 stick unsalted butter with 2 oz cream cheese until smooth. Add 1/2 cup orange marmalade and mix until just combined. Place in a serving dish and chill. Also delicious on tea breads, toast, dinner rolls, pancakes, french toast, or sweet potatoes! Check our BLOG for year-round specials. Call (828) 526-2060 or (866) 526-2060 Toll Free for Reservations.